Yellow Peter Wills bowl - 10½" (266 mm) diameter. 2001. Peter Wills has been earning his living as a potter since 1989. He quotes his influences as Sung and Tang Dynasty Chinese Pottery, European potters such as Hans Coper, Lucie Rie and Derek Davis, and, most strongly, Bernard Leach's seminal work, A Potter's Book. 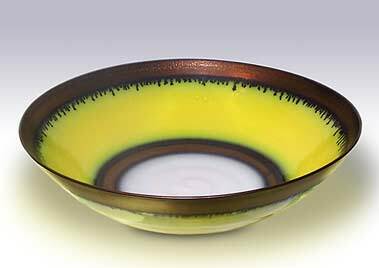 Peter worked from his small studio in Bridgend in South Wales, producing pots, mainly bowls, in stoneware and porcelain which he fires at 1280°C. He is regarded as one of the twenty-first century's important figures of ceramics; his work is widely exhibited and was chosen by Cherie and Tony Blair as gifts for visiting European Heads of State when they attended a summit conference in Cardiff. Peter temporarily stopped potting in 2005, but is planning to restart soon. (Let us know when you do, Peter, and we can update this information.) In the meantime he is still exhibiting world-wide, and fetching ever-growing prices at auctions.